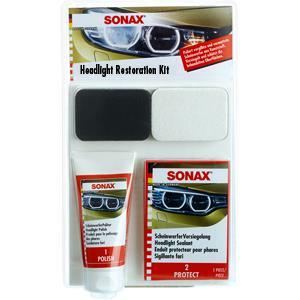 SONAX Headlight Restoration Kit simple three step process – requires no polishing machine. Step one: Use the circular sanding pad to gently remove stubborn headlight hazing. Step two: Use the abrasive polish and application pad to gently remove sanding marks. Step three: Use the towelette to apply a UV protective coating to maintain headlight clarity. Kit includes enough product for 4 headlight restorations (2 sets).